Hockey players and football players alike will be familiar with this look. Prank your mom, your coach, or just about anyone else with these dramatic and realistic Billy Bob Aviator Teeth. 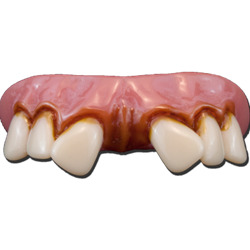 The Billy Bob Aviator Teeth include one set of faux teeth with heat activated molding pellets.